Why do I have bacterial regrowth in my distribution system? Your raw water is high in biopolymers which may serve as substrate. Is my flocculation process exhaustive in removing humic substances? I want to reduce AOX and THM further. The position of ”your” humic substances is in between aquagenic and pedogenic fulvic acids. A further reduction should be possible. Why is the DOC of ground water X so high? All DOC is humic matter of pedogenic origin, presumably originating from a fossile A horizon. The fundamental difference is the absence of biopolymers in ground waters. In river waters biopolymers originate from diffuse run-off from top soils or sewage effluents. A high N/C ratio, thus a high amount in proteinic matter is typical. 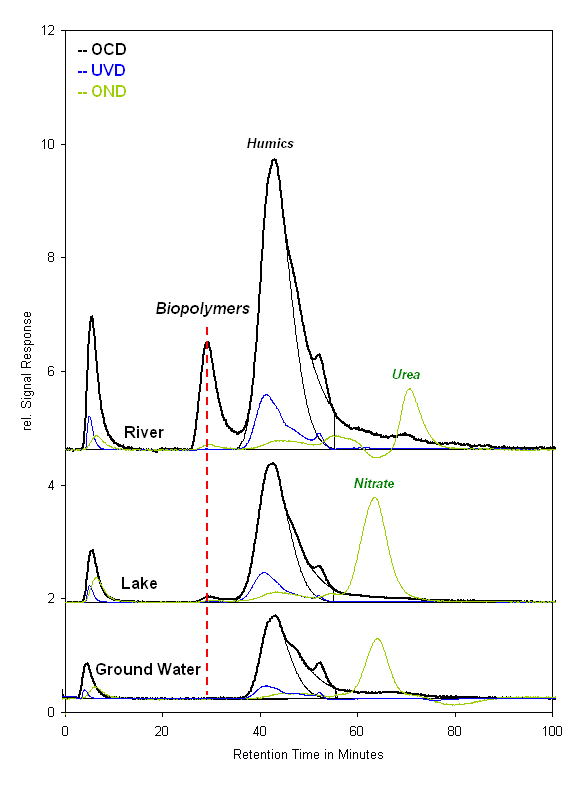 In lakes, biopolymers originate from algae and exhibit a low N/C ratio. This material is primarily polysaccharidic. In ground waters biopolymers should be absent. 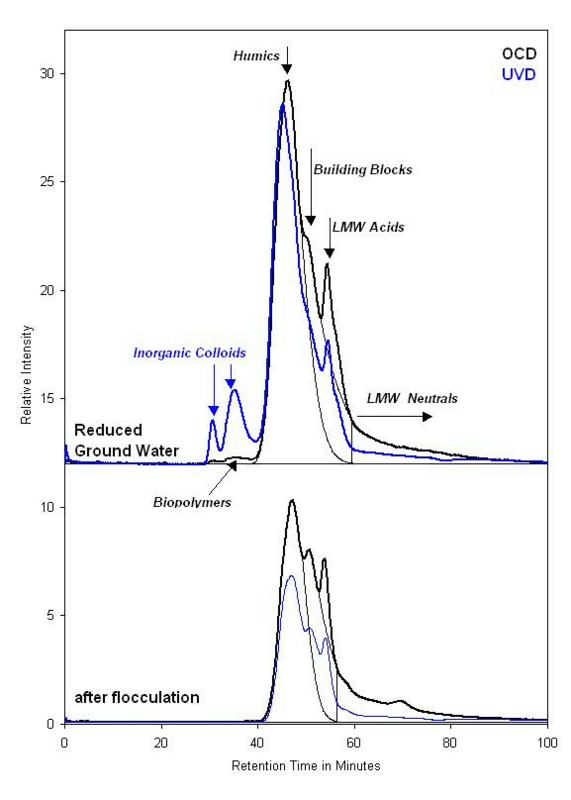 If not, then either a hydraulic contact to a surface water or a high microbial activity in the aquifer can be inferred. DOC about 4 ppm. 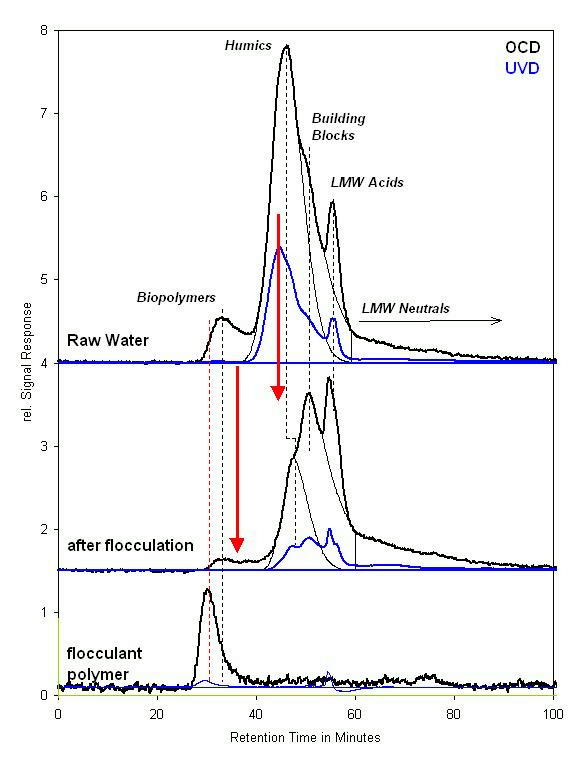 A surface water (biopolymers!) subjected to flocculation (deducible from ratio humics/building blocks). A very unusual water, because biopolymers are extremely high (650 ppb). Such values are normally only found for waste waters or shallow lakes with reed. 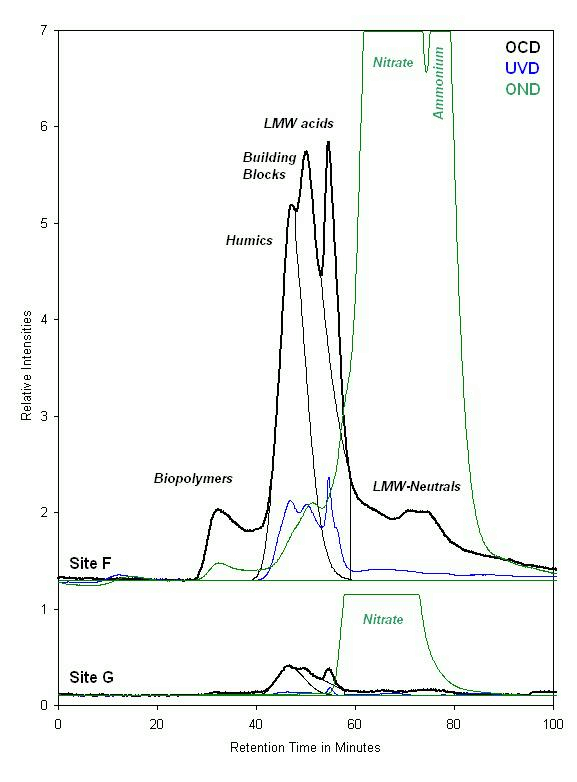 Also remarkable: Low in DOC (< 1 ppm) but – on a relative scale – high biopolymers. DOC < 100 ppb! Such waters are usually very old and come from deep wells. Such waters may also be found in shallow depth in areas of recent volcanic activities. Volcanic matter is a strong absorbent for DOC. Extremely high in DOC (6 ppm). High in Biopolymers and LMW Neutrals. Biopolymers contain about 50 % proteinic matter (high OND/DOC ratio). 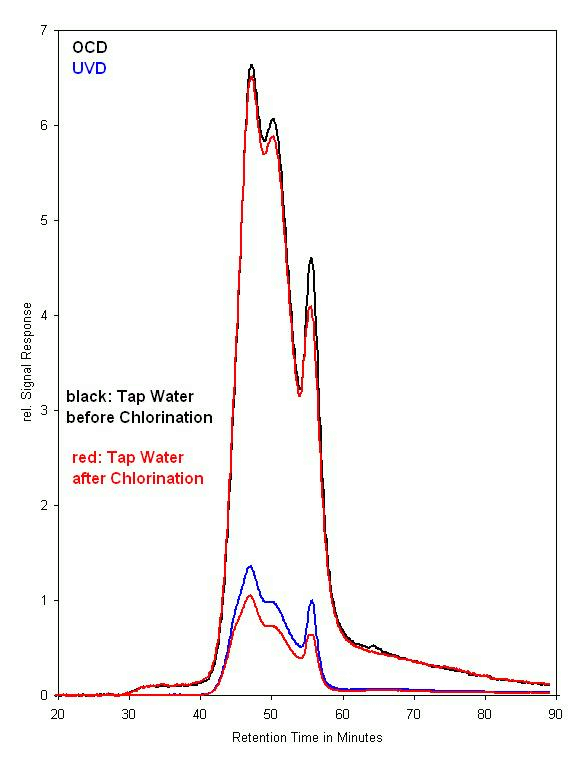 A Surface water subjected to flocculation and chlorination.High in Nitrate (> 30 ppm) and even ammonium. Flocculation removes selectively humics and biopolymers. The higher the pH, the less humics and the more biopolymers are removed. Example shows situation after addition of FeCl3 which is shown in the UVD. 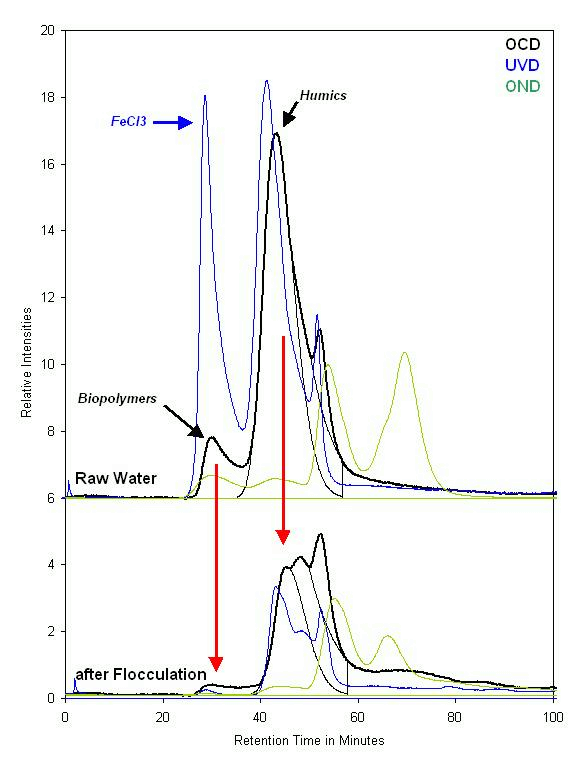 A flocculant polymer was added and question was risen whether flocculant polymer was still present after flocculation. Results suggest that this is not the case (residual polymer < 5 ppb). Ground waters are free of biopolymers. GW 1 is high in DOC (around 3 ppm). 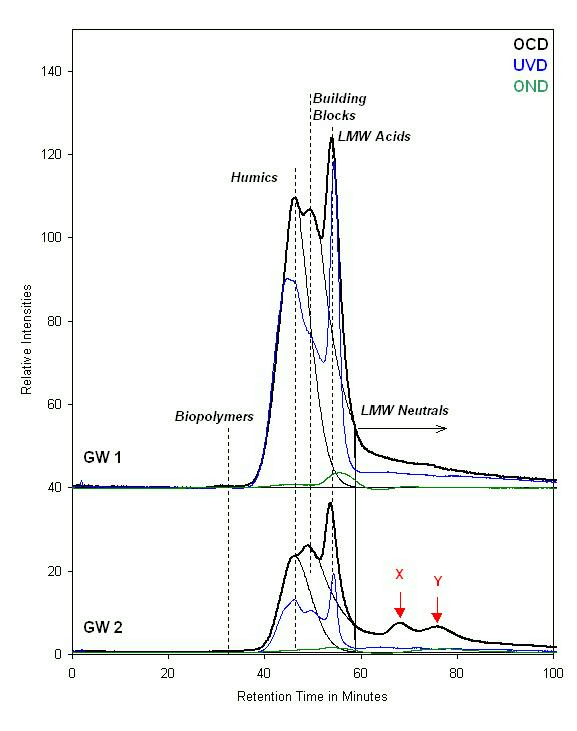 GW 2 is lower in DOC (around 1,5 ppm) but contains two compounds x and y which are usually not found in natural GWs. They could reflect contaminants or biodegradable NOM of recent microbial activity. Reduced ground waters may contain biopolymers due to microbial activity of methane-consuming bacteria. In addition, reduced GWs may contain inorganic colloids (reduced iron oxides). Humics are characterised by a particularly high UV/DOC ratio. Although the positive impact of sand filters on NOM is their microbial activity, care must be taken to prevent break through of microbially produced biopolymers. If this happens, more biogenic organic matter is found in the effluent than in the influent. 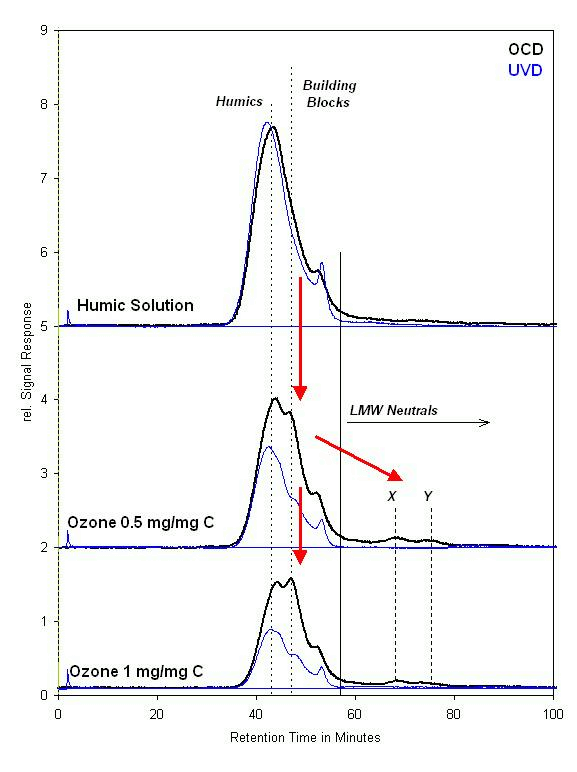 A humic matter solution was subjected to ozone. 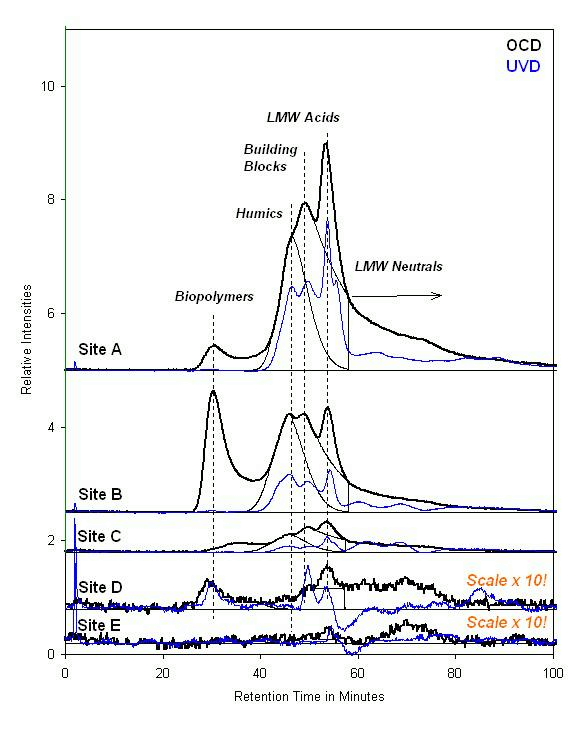 While reduction in DOC was slight, humics were strongly bleached (strong reduction in UVD response), Building Blocks and LMW-Neutrals were produced. If possible, disinfection should have no, or almost no impact on NOM. In the present case chlorination has only led to a slight decrease in UVD-response, hence to a slight bleaching (de-coloration) of humics. 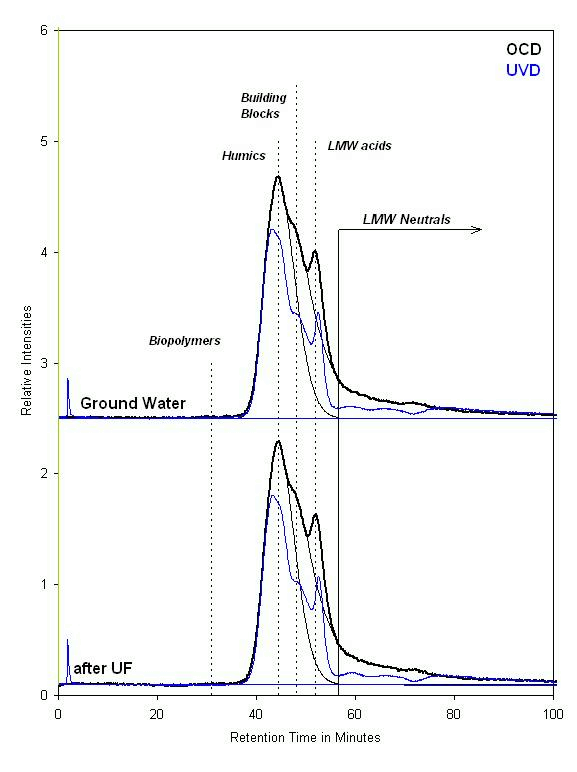 UF-membrane is to be expected. The HS-diagram plots the SAC/OC ratio of the HS-fraction against its nominal average molecular weight (Mn-value). SAC is the Spectral Absorption Coefficient obtained with the UVD. SAC/OC is the specific UV absorption of the HS peak, and a measure for HS aromaticity, considering that the response in UVD reflects aromatic and unsaturated structures. 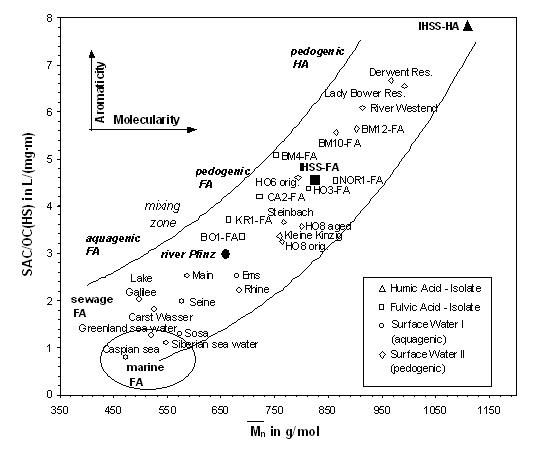 For the range of water samples measured, the SAC/OC ratio was plotted against Mn-values to produce a diagram for which we introduced in 1996 the term Humic Substances diagram or HS-diagram (Huber and Frimmel 1996). As shown, a close correlation exists between HS-aromaticity and HS-molecularity. origin. In the HS-diagram the positions for IHSS-FA and IHSS-HA are in the upper centre and upper right of the diagram (full dots). As both species were isolated from the same water it is clear that the position of the non-isolated, original IHSS-HS must be between the positions for IHSS-FA and IHSS-HA. Therefore, HS in the upper centre and upper right of the HS-diagram are of pedogenic origin. This is confirmed by the positions of other HS isolates of pedogenic origin (e. g. BM-10 FA, NOR-1 FA) and HS from brown water rivers whose catchment areas are bogs (e. g. river Westend, Lady Bower reservoir). 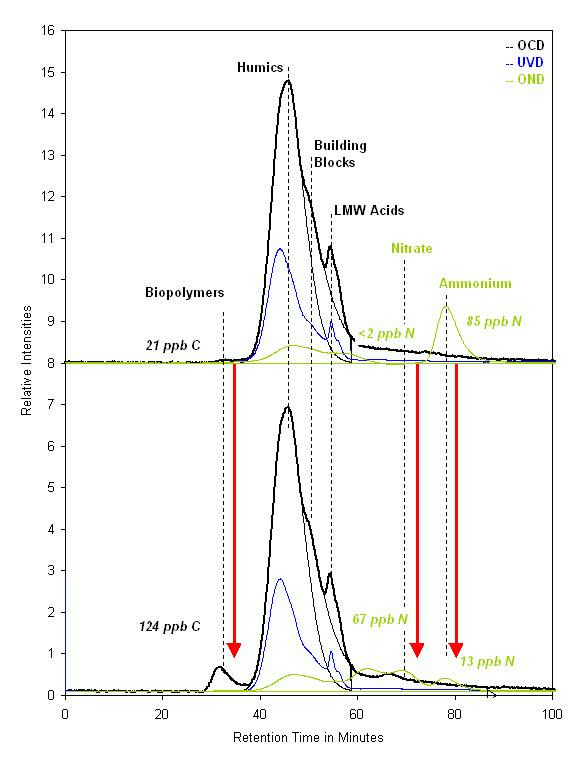 Below the position for IHSS-FA, HS of other isolates are found, but also HS from surface waters (e. g. Steinbach, Kleine Kinzig). This area reflects small rivers and creeks whose HS originate from areas with strong slopes. It is assumed that the high hydraulic energy allows relatively high molecular weight FA from soils to be washed into the water body. Often the aromaticity of these FA is lower in comparison to FA from brown water lakes. This is presumably due to sunlight induced bleaching of HS in the photic zone. Although in brown water lakes HS in the upper layer may also be subject to photobleaching, deeper layers are not accessible and the impact will be relatively low. At the left side of the HS-diagram FA derived from lakes are found (e.g. Lake Sosa, Lake Galilee, Caspian Sea). It is known that in lakes FA are also produced in-situ by microbial activity and are lower in molecular weight than soil-derived FA (Her et al. 2002b). HS from marine environments are also found here. Thus, this area reflects aquagenic, autochthonous FA in contrast to pedogenic, allochthonous FA. diagram we have to consider that a large proportion of NOM in many rivers originate from treated and untreated sewage, or Effluent Organic Matter (EfOM). HS in EfOM are a mix of town water HS which are typically of pedogenic FA type. These FA are superimposed by aquagenic FA produced either in sewage plants or in the river itself by microbial activity. Superposition of both species defines this area in the HS-diagram: a mixing zone containing both aquagenic and pedogenic FA. Thus, it can be concluded that the HS-diagram gives information about the origin of HS. The specificity of HS is remarkable and ”hallmarks” natural water bodies. The HS-diagram also can be used to assess the reactivity of HS in treatment processes.